Israeli police, last night, conducted a large-scale campaign across occupied Jerusalem, in which they abducted seven Palestinians, WAFA correspondence said. 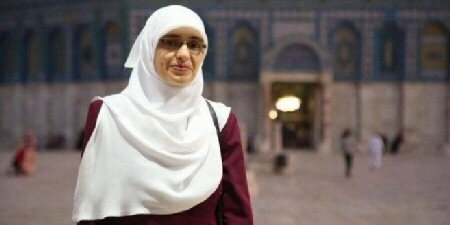 One of the detainees was identified as Hanadi Halawani, a well-known local activist who has been banned entry into Al-Aqsa Mosque compound on a number of occasions. In addition to Jerusalemite activist and teacher Hanadi Halawani, a number of youth were taken. One youth was also abducted from Hizma town, northeast of Jerusalem. The raid comes with news of hundreds of settlers breaking into the courtyards of Al-Aqsa Mosque for the “Destruction of the Temple” Jewish holiday.